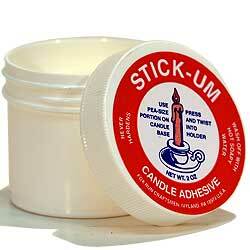 This 2 oz container of Stick Um is a very handy wax product to have around. 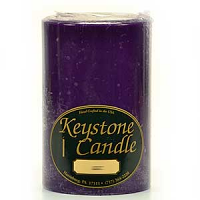 It is great for keeping candles standing straight. 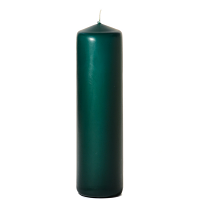 It is most commonly used on the bottom of taper candles when the candle holder is too large for a snug fit, causing the taper to lean. 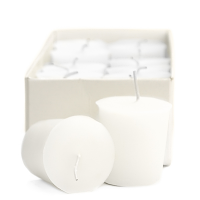 By simply placing a pea size ball of stick um candle adhesive in the bottom of the taper candle holder will keep you tapers standing straight. 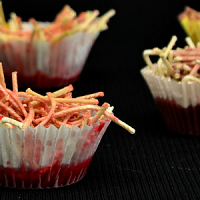 When a candle is leaning it can the flame burns closer to one side which can cause wax to drip. 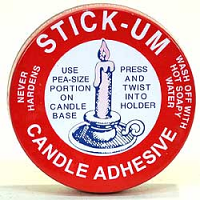 Stick um can also be used with other types of candles and holders to keep them in place. Advantages: Easy to use and works exactly as the description suggests! Just what I need for a quick fix. Best product for holding candles in place. Beats those single buttons by a mile. Advantages: Excellent price for large container. This product is super! 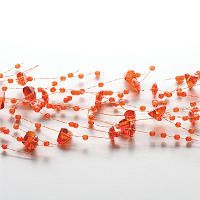 I have purchased the little dots in the past and they are expensive and you have to keep them wrapped up so they won't get on other things. 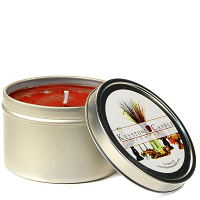 The candle is very well made, burns well, smells wonderful and was very promptly sent.